Airfree P2000 Filterless air purifier is maintenance free and totally silent featuring the patented Thermodynamic TSS Technology gradually destroys mold, allergens, dust mites, bacteria, viruses, pollens, pet dander, tobacco, ozone and other organic pollutants. It is perfect for mold contaminated areas as well as asthma and allergy sufferers. Airfree’s exclusive technology is completely silent and does not require any filters or maintenance. Just plug it in and let it do the job. Airfree’s awarded design perfectly fits your home decor. Covers 550 sq ft. Excellent for small areas like nurseries, bathrooms, playrooms, pantries and more. Airfree P2000 air purifier is the best maintenance free and silent air purifier for small to medium sized areas. Top air purifier for germs and mold when noise and space can be a concern. Eliminates dust mites, bacteria, fungi, virus, pollen, allergens of domestic animals and other microorganisms from the air. Coverage: 550 sqft. 2 YEAR Limited Warranty. Airfree 2000, P2000, comes in the color white. 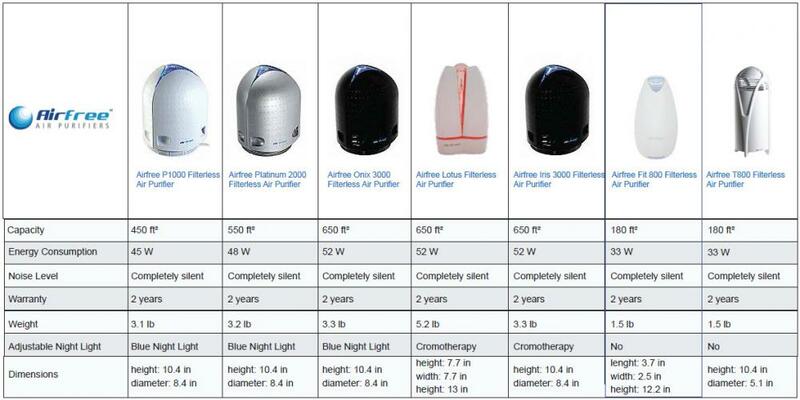 Available in over 50 countries, and rated among the best air purifiers in the United States, Airfree products reduce microbiological contamination in the air naturally, without using chemicals or filters. Recommended by doctors and with no contraindications, they can be used anywhere. The Airfree P2000's exclusive patented Thermodynamic Sterilizing System (TSS) technology has been independently tested in "real life" working environments by world renowned institutions and IS-17025 laboratories in six different countries including the USA, Sweden, and Germany. These tests prove that the Airfree P2000 Air Sterilizer totally destroys up to 99.99% of microorganisms that pass through its patented TSS system no matter how small or hazardous they might be. Inside the P2000's patented ceramic core, 99.99% of all microorganisms: spores, fungus, bacteria, virus, mold spores, are incinerated at temperatures around 400F (250C). That is done without significant heat contribution to the unit. No living microorganism survives this power. H 10.4" x W 8.4" x D 8.4"
Airfree exclusive and patented Thermodynamic TSSTM Technology has been independently tested in “real life” working conditions by world renowned institutions and ISO 17025 laboratories in six different countries including the USA, Sweden and Germany. These tests prove that Airfree totally destroys 100% microorganisms that pass through its patented system, no matter how small or hazardous they might be. Airfree offers a detailed copy of the independent tests on its website www.airfree.com assuring consumers of its outstanding efficiency in drastically reducing airborne microorganisms. Exclusive Patented Thermodynamic TSSTM Technology. Airfree applies the same concept as boiling water by using heat to destroy microorganisms and attains 100% efficiency at the Airfree air outlet. 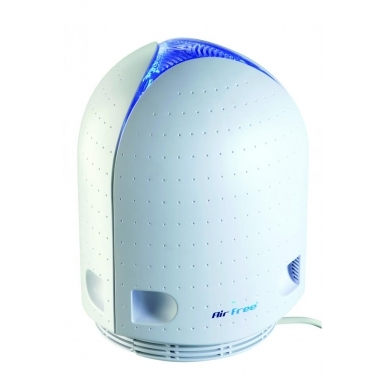 Airfree gradually eliminates mold, allergens, dust mites, bacteria, viruses, pollens, pet dander, tobacco, ozone and other microorganisms from the air. The entire process is completely silent and requires no maintenance, not even the occasional replacement of filters. All you have to do is switch on the device and let it do the job. Airfree emits no ozone. The Airfree Thermodynamic TSSTM Technology generates no dangerous emissions, NO ions, NO UV light and NO ozone. In fact, independent tests in laboratories in Sweden demonstrate that Airfree actually reduces ozone by 26%. Ozone is a toxic gas that according to the EPA (Environmental Protection Agency) can trigger asthma and destroy lung tissue. The beauty of Airfree is its simplicity. One of the best benefits of Airfree is that it does not require any filters or replacement parts. This will save you money and time. For those that are allergic, contact with infected materials can be very harmful, possibly resulting in a severe allergic reaction. Airfree’s Exclusive Thermodynamic TSSTM Technology will do the job without requiring maintenance of any kind. An air purifier is a device usually installed in bedrooms. Airfree air purifier must be not only quiet but actually must be completely silent to guarantee a better indoor environment. Airfree is proud to offer high efficiency together with a completely silent air purification solution. Besides being efficient and completely silent an air purifier should allow for easy integration with your home decor. Airfree offers a compact and awarded design that will perfectly fit in your home. Airfree comes with a fancy adjustable and harmonic night light that may help you create a cozy and comfortable environment. Ideal for bedrooms and nurseries. Airfree Thermodynamic TSSTM Technology does not use filters or fans therefore it has a very low energy consumption. Airfree is manufactured with high quality materials in a modern installation in Europe assuring high quality products. worldwide could be able to enjoy the benefits of a simple, effective concept. Airfree products are being exported to more than 50 countries across Europe, the Americas, Asia and Africa. 5.0 Anonymous' rating and review 07/11/2014 By anonymous I decided it was important for our girls to have an air purifier, so I gave them ours. After one night of not sleeping with it, I can really tell a difference. Both my husband and I woke up congested and he snores a lot. I am back online looking for another unit. This really is the best air purifier. 5.0 ANONYMOUS' RATING & REVIEW 01/17/2014 By Anonymous Let me just begin by saying how amazing this unit is. We had the P2000 in our bedroom and were so happy. I wasn't waking up congested and the rooms air was perfect. So, I decided it was important for our girls to have an air purifier so I gave them ours. After one night of not sleeping with it, I can already tell a difference. Both my husband and I woke congested and he snored a lot last night. Needless to say, I'm back on line looking for another unit. This really is the best air purifier.